German Hyperinflation – The Undiscovered Truth – Do Coins Survive? When the Weimar Republic first began following the 1918 Communist Revolution, they issued coins assuming they were now in control. The 50 pfennig coins were struck between 1919 and 1922. There were no precious metal or even bronze coins struck during the hyperinflation that began from August 1922 to November 1923. The coinage of the Weimar Republic between 1922 and 1923 were all struck in aluminum. During a hyperinflation, the only real currency to hold on to some value is the coinage. The price of raw materials rises and as such, the coins become worth more as scrap metal than they so as coins from a legal tender perspective, but this is AFTER the hyperinflation – not during. The stories that people saved their copper coins and were able to spend them with a higher value than paper are really just stories. 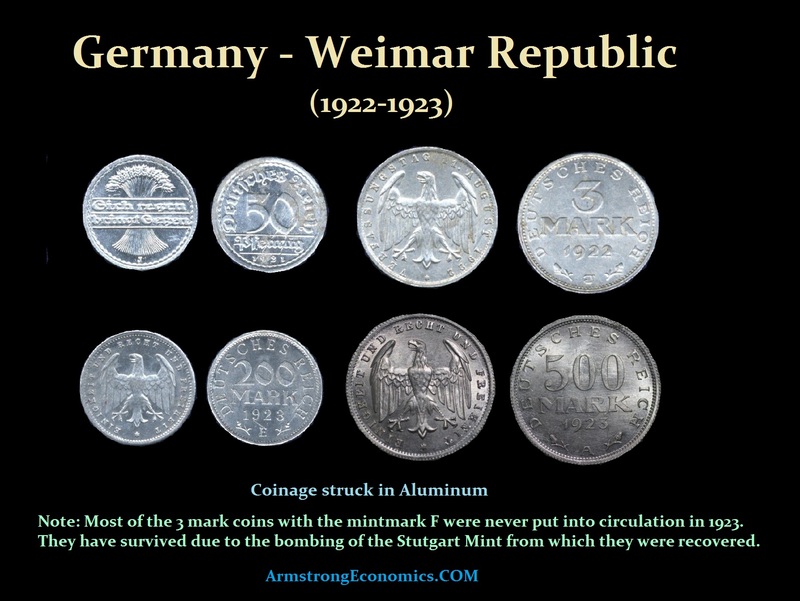 The coinage of the Weimar Republic was aluminum, not even copper. I do know that AFTER the event when confidence returns to the economy, then the base metals will start to rise in value because the economy is expanding once again. 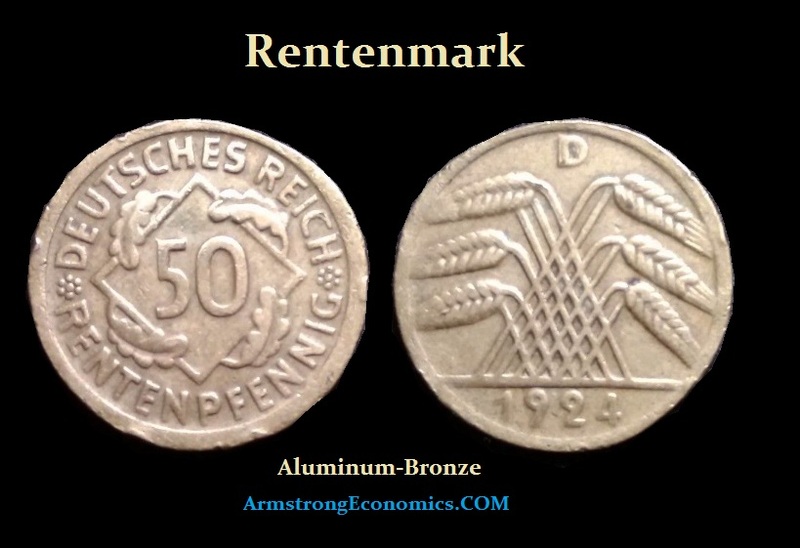 The Rentenmark was a currency issued on October 15th, 1923 to stop the hyperinflation of 1922 and 1923 in Weimar Germany. The largest denomination was just 50 pfennig. It was struck in Aluminum-Bronze. Those who ask about coins surviving the hyperinflation, the answer is NO. You can save them from the pre-hyperinflation, but during such an event, not even the old coins will buy you a cup of coffee.